The Lawrence Berkeley National Laboratory (Berkeley Lab) Electrical Equipment Safety Program (EESP) is designed to ensure safe operation and installation of electrical utilization equipment. Only electrical utilization equipment that has been approved by the Authority Having Jurisdiction (AHJ) may be used at Berkeley Lab. Electrical utilization equipment that has been accepted, certified, labeled, or listed by a Nationally Recognized Testing Laboratory (NRTL) is considered to be acceptable to the AHJ, and is approved for use provided the equipment is installed and used within the manufacturer’s listing intent. Electrical utilization equipment that has NOT been accepted, certified, labeled, or listed by an NRTL is not acceptable to the AHJ unless it has satisfactorily passed a documented safety inspection. In order to meet these requirements Berkeley Lab has established the Electrical Equipment Safety Program. Electrical utilization equipment that has been listed by a Nationally Recognized Testing laboratory (NRTL), is being used in accordance with its manufacturing and listing intent, undamaged, and unmodified, is automatically approved by the AHJ and may be used without any further approval process. Electrical utilization equipment that has been previously found acceptable does not require re-inspection when repaired by qualified individuals using like-for-like repair parts. Equipment that is being modified from its original design must be re-evaluated and found acceptable by the AHJ before being used. The Electrical Equipment Safety Program (EESP) applies to any individual who uses electrical equipment, including all Berkeley Lab employees, subcontractors, and facility users. All Unlisted or modified NRTL-Listed electrical equipment requires inspection and approval prior to use. Unmodified NRTL-Listed Equipment. Equipment that is listed by an NRTL and has not been modified. Unused Equipment. Equipment that is not being used, e.g., in storage, staged for salvage or excess, etc. Equipment that is not being used must be labeled with the EQUIPMENT OUT OF SERVICE label (see Appendix B) so it is clear it is not in use. Equipment Granted Conditional Acceptance under Work Process E. Prototype or proof-of-concept equipment (e.g., test chassis, bench top experiment) in the process of being built to test the validity of a design and that is under the exclusive control of the designer if used for less than three months. Equipment being developed that exceeds a three-month period may be acceptable but requires Conditional Acceptance per Work Process E.
Note: Equipment that is connected to AC only via a step-down transformer/AC adapter with voltage output less than 50 volts is exempt, but the transformer/AC adapter must be NRTL Listed. Establish, through the development and administration of the LBNL Electrical Equipment Safety Program (EESP – this program) the necessary policies, processes and procedures which provide effective assurance of these functions. Oversees the EESP inspection process. Advises on electrical safety matters and promotes electrical safety at Berkeley Lab. The ESSC is a resource to aid in the development of inspection criteria, training, and program administration. If there is a disagreement that cannot be resolved by the Engineering Division AHJ and the EHS Electrical Safety Program Manager, the ESSC will assist the Deputy Lab Director for Operations in evaluating an appeal in accordance with Chapter 8, Work Process B. Notify the EESP of any new Unlisted equipment being purchased. Remove from service equipment that has been labeled AHJ FAIL. Obtain EESP inspections for procured Unlisted equipment. Complete EHS0384, Equipment Surveyor annual refresher course. Acceptable to the Authority Having Jurisdiction (AHJ). If it is not determined to be safe by a Nationally Recognized Testing Laboratory (NRTL), it is acceptable if it is inspected or tested by another federal agency, or by a state, municipal, or other local authority responsible for enforcing occupational safety provisions of the National Electrical Code and found in compliance with the provisions of the National Electrical Code. Custom-made equipment or related installations that are designed, fabricated for, and intended for use by a particular customer is acceptable if it is determined to be safe for its intended use by its manufacturer on the basis of test data that the employer keeps and makes available for inspection to the Berkeley Lab AHJ and the AHJ’s authorized representatives. Electrical utilization equipment is "accepted" if it has been inspected and found by a Nationally Recognized Testing Laboratory (NRTL) to conform to specified plans or to procedures of applicable codes. The delegations for the Electrical AHJ function are described in the ES&H Manual Electrical Safety program. There is no third-party verification of conformity through inspection or testing. The standards are not recognized for applicability in the United States. equivalency An alternate method for a mandatory requirement that offers the same or greater protection from a hazard. The Technical AHJ is delegated the special authority to approve alternate methods when it is assured that equivalent objectives can be achieved by establishing and maintaining effective safety equal to, or exceeding, established codes, regulations, and standards. An organization that performs electrical equipment safety inspections and that is recognized by the AHJ. It is recognized by the AHJ if it meets the requirements of NFPA 790 and NFPA 791.
interpretation A decision as to whether a part of the code applies or is satisfied in a particular situation. Any person with suitable knowledge (through training or experience) in the codes can make an interpretation. However, only the Technical Authority Having Jurisdiction (AHJ) shall be permitted to make a final interpretation, which is called a determination. Electrical utilization equipment is “labeled” if there is attached to it a label, symbol, or other identifying mark of a Nationally Recognized Testing Laboratory (NRTL)that (1) makes periodic inspections of the production of such equipment and (2) whose labeling indicates compliance with nationally recognized standards or tests to determine safe use in a specified manner. Electrical utilization equipment is “Listed” if it is of a kind mentioned in a list that is published by a Nationally Recognized Testing Laboratory (NRTL) that (1) makes periodic inspection of the production of such equipment and (2) states that such equipment meets nationally recognized standards or has been tested and found safe for use in a specified manner. An organization that is recognized by OSHA and that tests for safety, or lists, labels, or accepts equipment based on established national standards. The NRTL is an independent third party and is not the manufacturer of the product or a government agency. A partial list of NRTL labels is provided in Appendix A. Manufacturers listed in Appendix D are considered reputable and provide adequate technical support and technical documentation, and follow standard accepted safe designs even though they do not always obtain NRTL listing for their products. The process of identifying and indexing Unlisted electrical utilization equipment that will later be inspected by a designated EESP Equipment Inspector. Personnel identified by their division to conduct the NRTL survey for their organization are referred to as Electrical Equipment Surveyors. Before conducting the survey, Electrical Equipment Surveyors must complete training course EHS0381. Electrical utilization equipment is “Unlisted” if it is not listed. This Electrical Equipment Safety Program provides standard criteria for evaluation, labeling, and documentation of Unlisted electrical equipment. The Occupational Safety and Health Administration (OSHA) requires explicit approval of all electrical equipment in the workplace to ensure that it is free from recognized hazards that are likely to cause death or serious physical harm to employees. To improve and maintain electrical safety at Berkeley Lab, the only electrical equipment to be used must have been approved as safe for its intended use. Unlisted electrical equipment shall be examined for safety before use as required by Title 29 of the Code of Federal Regulations (CFR), Part 1910, Occupational Safety and Health Standards, Section 303(a). NRTL-Listed equipment must be purchased and used if available. For new or replacement equipment, an NRTL-Listed product must be purchased instead of an Unlisted product if both exist. All NRTL-Listed equipment must be used for its intended purpose in accordance with the manufacturer’s instructions. Otherwise, the equipment must be treated as Unlisted and must require inspection and approval by the AHJ before use. Electrical Device Listing: All delivered electrical equipment, components, and conductors must be accepted, or certified, or listed, or labeled, or otherwise determined to be safe by a Nationally Recognized Testing Laboratory (NRTL) recognized by the Occupational Safety and Health Administration (OSHA), in accordance with Title 29 of the Code of Federal Regulations, Part 1910 (OSHA 29 CFR 1910). The supplier must notify the University Procurement Representative or the University Technical Representative, if designated, in writing of any delivered items that do not meet these requirements. If the supplier does not provide this notification, the University reserves the right to refuse delivery or return the item. The buyer must notify the requestor. The requestor must specify an alternate product that is NRTL Listed, if possible. If an NRTL-Listed substitute is available and is acceptable to the requestor, it must be selected instead of any Unlisted product. If no NRTL-Listed substitute is available, the buyer must notify the EESP Program Manager to evaluate options and possibly arrange for an EESP inspection. The cost of the EESP inspection is covered by the division. Additionally, manufacturers of custom equipment must be notified in writing of the applicable design standards to follow for electrical safety. If the EESP Program Manager determines that the product complexity is such that Berkeley Lab equipment inspectors do not have the requisite training or skills to perform the inspection, a Third-Party Field Evaluation is required. The requestor is responsible for arranging the Third-Party Field Evaluation. The cost of the Third-Party Field Evaluation is covered by the division. Whether the EESP inspection or Third-Party Field Evaluation is performed, the requestor is responsible for determining any impact this may have on warranties or returns. The EESP Survey is the identification and documentation of unlabeled electrical utilization equipment into the EESP database so that an EESP inspection can be performed. Electrical utilization equipment that is already field evaluated and labeled by a Third-Party FEB is not required to be surveyed. Divisions are responsible for surveying all of their own equipment. The division may designate as many equipment surveyors as is necessary. All designated surveyors are required to take a short self-study course (EHS0381). Upon completing the course, the surveyors are issued a set of survey labels and provided with password access to the EESP database. It is acceptable to designate one or more surveyors for each project in the division. Survey Criteria for New Equipment: New equipment must be surveyed immediately upon delivery to the Equipment Supervisor. The EESP Program Manager may grant immediate Conditional Acceptance for up to 120 days in accordance with Work Process E. The EESP inspection must be completed prior to the expiration of the grace period. Survey Criteria for Legacy Equipment: All electrical utilization equipment within the electrical requirements specified in the scope of this program, whether custom-built or commercially made, must be examined to determine if it is labeled by an NRTL. Equipment that is not labeled by an NRTL must be considered Unlisted and must be entered into the database. NRTL-Listed equipment must not be entered into the database unless it has been modified or is being used for some purpose outside of the original design intent. Required survey labeling: All Unlisted equipment must be labeled with a Berkeley Lab AHJ barcode (see Appendix B), and the identifying information must be entered into the database. If the equipment is in storage and not expected to be used, it is not required to be surveyed. However, it must be prominently labeled “EQUIPMENT OUT OF SERVICE – AHJ INSPECTION NEEDED BEFORE USING” (see Appendix B). See Work Process G for more information about out-of-service equipment. Recommended survey labeling: NRTL-Listed equipment may be optionally labeled with a green “NRTL LISTED” sticker (see Appendix B). The purpose of this label is to indicate that the surveyor found an NRTL mark somewhere on the equipment and no further action is required. Since the manufacturer’s NRTL mark is often on a less visible part of the equipment, using this sticker prevents redundant observations, making the surveying process more efficient. This label is not mandatory, and there is no requirement to document NRTL-Listed equipment. Older versions of this sticker, including one with “NRTL APPROVED,” are acceptable. Risk ranking is used by the Berkeley Lab EESP in order to prioritize resources and address the equipment inspection requirements with due consideration for minimizing the overall risk to the Lab. While all Unlisted equipment is required to be inspected and approved before use, risk ranking helps to focus the greatest scrutiny and urgency on those items that pose a greater overall safety hazard. Risk ranking is therefore used throughout this document to adjust inspection depth, conditional usage, and inspection scheduling. High risk: High-risk equipment is all Unlisted equipment not covered under the medium- or low-risk categories below. A representative sample from the manufacturer has been field evaluated and approved by an EESP Inspector. Inspection must be performed according to the requirements for high-risk equipment as required in this document. The manufacturer has a North American office/distributor (e.g., listed in the Thomas Register®). The manufacturer services its products and provides technical support. The manufacturer provides adequate documentation in English (acceptable to the EESP Program Manager). Equipment nearly identical to other Berkeley Lab–approved equipment, as approved by the EESP Program Manager. The equipment has not yet been inspected. The equipment has failed inspection but is temporarily authorized for use pending repairs if the reason for the failure does not represent an immediate hazard. The equipment has passed inspection but has certain limitations on its usage. Equipment that has been Conditionally Accepted is approved for use by the owner, subject to restrictions. These restrictions must be specified at the time of Conditional Acceptance. All legacy equipment (surveyed before October 1, 2013) currently in use is Conditionally Accepted by the AHJ for unlimited usage pending inspection. This Conditional Acceptance is on file with the EESP Program Manager. New equipment (surveyed on or after October 1, 2013), or legacy equipment not currently in use must be inspected prior to use. The EESP Program Manager may authorize Conditional Acceptance after a short visual inspection, pending a full inspection grace period not to exceed 120 days. This grace period is provided to give the equipment owner the necessary flexibility to obtain the inspection while minimizing the impact on ongoing research or operations. After the grace period, the Conditional Acceptance status expires and the equipment must not be used until inspected satisfactorily. Equipment that fails inspection for reasons related to long-term hazards may be Conditionally Accepted pending a repair grace period not to exceed 120 days. This grace period is provided to give the equipment owner the necessary flexibility to effect repairs while minimizing the impact on ongoing research or operations. After the grace period, the Conditional Acceptance status expires and the equipment must not be used until repaired and re-inspected satisfactorily. Equipment that fails inspection due to conditions that present immediate hazards must not be Conditionally Accepted and must not receive any grace period for continued use pending repair. The equipment must be taken out of service immediately according to Work Process G.
Equipment with restricted usage: The EESP Program Manager may decide to pass equipment but impose restrictions on the use of the equipment. This typically applies to highly-customized experimental setups that consist of groups of equipment tied together as research systems. Such non-standard wiring may not present a risk for use but should not be re-used in a different application without re-inspection. Conditionally Accepted equipment must be labeled with a yellow CONDITIONAL ACCEPTANCE label (see Appendix B), with the exception of uninspected legacy equipment. Surveyors may apply a CONDITIONAL ACCEPTANCE label on new, uninspected low-risk equipment with an inspection due date of 120 days. For medium- and high-risk equipment, contact the EESP Program Manager. 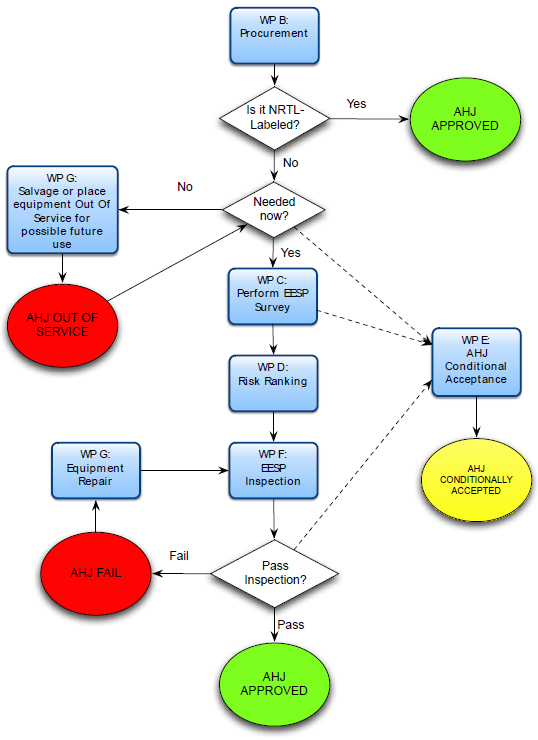 Unlisted equipment that has been neither approved nor Conditionally Accepted, or for which the Conditional Acceptance grace periods have expired, must be immediately placed out of service with a red EQUIPMENT OUT OF SERVICE label (see Appendix B ). The EESP Program Manager reserves the right to refuse inspection and/or conditional acceptance of common, low-value, commercially available, off-the-shelf equipment that is not NRTL Listed, where NRTL-Listed equivalents are readily available and sourced. This includes generic laboratory equipment such as variacs, power supplies, and other auxiliary equipment. Inspections required in this section are minimum safety requirements that must be satisfied in order to obtain Berkeley Lab AHJ approval. The inspections described here are not as thorough as full NRTL Listing inspections, and therefore they are not equivalent. All equipment that is subject to EESP inspection in accordance with the scope of this program must be inspected by one or more of the following methods. Additional criteria may be applied at the discretion of the EESP Program Manager or Inspector. For custom designed and built equipment, it is typically more efficient and effective to include EESP involvement early in the process. In so doing, any safety issues can be resolved proactively, and final acceptance of the project will be assured. At the onset of the project, an EESP representative is assigned. The EESP representative attends engineering and project reviews as well as conducts routine safety inspections during the construction phase. At the conclusion of this process the equipment or project is certified as being compliant and accepted as AHJ approved. Prior to placing the equipment into service, a minor inspection must be completed by an EESP equipment inspector. Once the inspection has passed, the equipment will have a label affixed to it certifying compliance. The EESP Program Manager determines that the scope of examination of the equipment is beyond the capabilities of the qualified and authorized Berkeley Lab EESP Inspectors. Equipment owners may also elect to attain Third-Party Field Evaluation in lieu of Berkeley Lab EESP inspection. The Third-Party Field Evaluation must be funded by the organization that is responsible for the equipment. Equipment subjected to Third-Party Field Evaluation must be surveyed and entered into the EESP database. Only Field Evaluating Bodies meeting the requirements of NFPA 790, Standard for Competency of Third-Party Field Evaluating Bodies are to be authorized by the AHJ to perform a Third-Party Field Evaluation. Third-Party Field Evaluation must follow the inspection requirements of NFPA 791, Recommended Practice and Procedures for Unlabeled Electrical Equipment Evaluation. Applicable documentation of Third-Party Field Evaluation must be submitted to the EESP Program Manager for review and approval and entry into the EESP database. After the preliminary inspection by the FEB Field Evaluator, the AHJ must review the report and make an assessment of the deficiencies discovered. The AHJ must then decide which deficiencies represent a hazard that must be corrected and which deficiencies represent a negligible concern and will be accepted by the AHJ without correction. Legacy equipment will not always be compliant with the latest construction standards. The EESP Inspector must use discretion in allowing for minor deviations from current standards. No deviation is allowed for shock hazards or other immediate safety hazards likely to cause fire, electrical shock or arc blast. If necessary, the EESP Program Manager will assist the EESP Inspector in making a determination. Each piece of equipment must be surveyed, bar-coded, and entered into the database. One (or more, at the discretion of the inspector) representative model must be inspected by an EESP Inspector. If the equipment passes inspection, all of the units are considered to have passed. The inspection record for all of the identical units must reference the original inspection. If the equipment fails inspection, all of the units are considered to have failed. The inspection record for all of the identical units must reference the original inspection. Equipment that passes the EESP inspection must be labeled with a green AHJ APPROVED sticker. Equipment that passes the Third-Party Field Evaluation must be labeled with the FEB’s field evaluation sticker and with a green AHJ APPROVED sticker. Equipment that fails the EESP inspection must be labeled with a red AHJ FAIL sticker, unless it is Conditionally Accepted per Work Process E.
Labels can be found in Appendix B. Equipment that has failed the EESP inspection but is still required for use must be repaired by a qualified repair technician. Repairs can be scheduled with the Engineering Division. Upon completion of the repairs, an independent EESP Inspector must perform a re-inspection. The technician that performed the repair may not perform the re-inspection even if she or he is an authorized EESP Inspector. If the repaired equipment passes the re-inspection, the equipment is approved by the AHJ for usage and receives a green AHJ APPROVED sticker (see Appendix B). The Equipment Supervisor may decide to forego the repairs and salvage the equipment instead. Because of past experience where salvaged equipment is returned to service without authorization, all of the EESP labels should remain on the equipment. Equipment that is salvaged without inspection must be labeled with a red EQUIPMENT OUT OF SERVICE label (see Appendix B). Equipment that is salvaged after failing inspection must be labeled with a red AHJ FAIL sticker and an EQUIPMENT OUT OF SERVICE label (see Appendix B). Additionally, the cords must be cut off and an Electrical Hazard warning sticker must be applied in a prominent manner to the equipment. The Equipment Supervisor may decide to take Unlisted equipment out of service indefinitely without performing surveys, inspections, or repairs and without salvaging. Out-of-service Unlisted equipment must be labeled with a red EQUIPMENT OUT OF SERVICE label (see Appendix B). Should the Equipment Supervisor decide to begin using Unlisted equipment that was previously placed out of service, he or she must perform the equipment survey and contact the EHSS Electrical Safety Program Manager to schedule the inspection. If an inspection was already performed and failed, the repairs and re-inspection must be completed satisfactorily prior to use. Candidates for EESP Surveyor are not required to have prior electrical experience. Once designated by their division, candidates are required to take EHS0260, Basic Electrical Hazards and Mitigations and EHS0381, Electrical Equipment Surveyor Training. Annual refresher training is provided with EHS0384, Annual Information Update for Surveyors. Candidates for EESP Inspector must be Qualified Electrical Workers according to the Electrical Safety Program and must have prior experience with electrical equipment construction and testing methods. Berkeley Lab Engineering Technologists and Electricians are considered suitably experienced to perform the duties of EESP Inspector. Other candidates may submit their experience and credentials to the EESP Program Manager for review and approval. EHSS will provide training course EHS0383 to candidates who meet the necessary prerequisites. Candidates who pass training course EHS0383 are authorized by the EESP Program Manager as EESP Inspectors to inspect equipment. Title 29 CFR, Part 1910, Occupational Safety and Health Standards. The relevant parts for this program are 1910.303(a) and 1910.399. National Fire Protection Association (NFPA) 70, National Electrical Code, (2017) . The relevant articles for this program are 90.7, 110.2 and 110.3. NRTLs use marks to label products that have been Listed. However, the presence of the mark on a product does not necessarily mean that it meets OSHA requirements since NRTLs sometimes use these same or similar marks for non-OSHA purposes. OSHA accepts only those products that contain the NRTL's mark and that the NRTL has certified within its scope of recognition, which includes the test standards and testing sites that OSHA has recognized for the NRTL. See the OSHA web page for information on each NRTL's scope of recognition or contact OSHA or the NRTL for additional information. Green NRTL LISTED label (optional): For equipment that is NRTL Listed, unmodified, and used as intended by the manufacturer. This label communicates that the NRTL mark appears somewhere on the equipment so that others will not need to look for it. 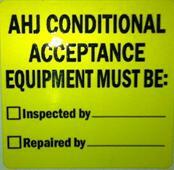 Yellow AHJ CONDITIONAL ACCEPTANCE label: Equipment that has not passed the equipment inspection but that may be used under certain conditions. Includes situations where: (a) the equipment has not yet been inspected, (b) the equipment has failed inspection but is temporarily authorized for use pending repairs if the reason for the failure does not represent an immediate hazard, and (c) the equipment has passed inspection but has certain limitations on its usage. Red EQUIPMENT OUT OF SERVICE label: Equipment that is not being used, is not intended to be used in the foreseeable future, and is not connected to an electrical source is not required to be surveyed or inspected. This sticker informs the user that an inspection is required before the equipment can be used. Example Third-Party Field Evaluation sticker: This may vary depending on the Field Evaluating Body (FEB) performing the inspection. Other Third-Party Field Evaluation Bodies may be approved by the EESP Program Manager.